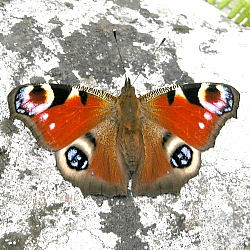 Habitat: The Peacock butterfly like the Small Tortoiseshell is widely distributed and can be found in most habitats. 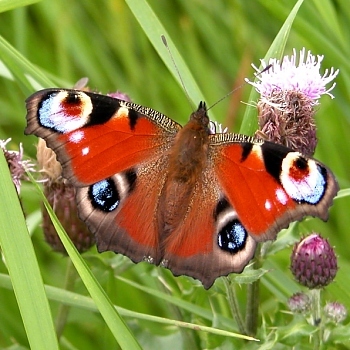 It may be frequently seen on nectar plants such as thistles at any time of the year except for a period in June/July. It has a single brood annually. and flying until early May or later. Mid-July to mid-September (first generation). Hibernation: Overwinters as an adult butterfly. This is arguably the most spectacular of the Irish butterflies. 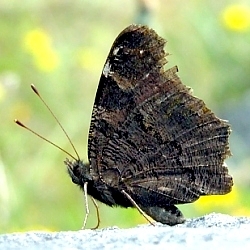 Butterflies seen from November to February have probably been disturbed during their hibernation. in layers, under the young leaves of Common Nettle Urtica dioica. speckled white dots and many black spines. 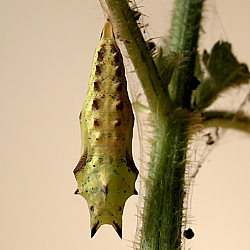 After about one month, when fully grown, they disperse to pupate. from the ground. The pupal stage c.2-4 weeks. September to the following spring when they resume flight on the first warm sunny day. They are seen on the wing from c.late February to early March onwards, when mating and ovipositing takes place. [ Hesperidae ] [ Pieridae ] [ Lycaenidae ] [ Nymphalidae ] [ Satyridae ] [ Migrants ] .